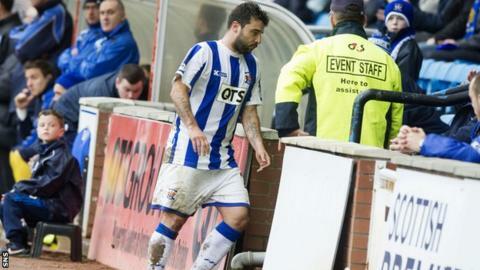 Allan Johnston defended Alexei Eremenko after an angry reaction to being substituted during Kilmarnock's 2-1 defeat to St Johnstone. Goals from Fraser Wright and Steven Anderson cancelled out Robbie Muirhead's early opener for the hosts. Johnston felt the heavy pitch had taken its toll on the Russian-born Finland international as they chased the game. "Alexei is fine," he said. "It's hard on the legs and you could see at the end both teams looked tired." He continued: "But Alexei is just desperate to win. There's nothing wrong with that. At least he is showing he is passionate and cares that he wants to get a result. "That's what we need - everyone trying their utmost to get the win so we avoid this dreaded play-off spot." Kilmarnock were ahead after only five minutes when Muirhead slid onto the rebound after Kris Boyd's shot on the turn was saved. It's going to make it difficult now, there's a lot of massive games coming up. "We started really brightly, playing some really good football in the opening 20 - 25 minutes," Johnston told BBC Radio Scotland. "Then to lose a goal from a corner is really disappointing and then obviously they followed that up by scoring another goal from a corner whereas we didn't look a threat at set-pieces. "They just showed an extra desire to get the ball and attack it better than us. You look at the other end of the park when we're putting balls in the box, but guys like Frazer Wright are putting their head in where it hurts and winning headers, Anderson as well. "It was probably one of the best we've played the first half obviously up until we lost the goal and then the heads went down a wee bit and that's what we can't have." The Rugby Park side sit only three points ahead of Partick Thistle in the relegation play-off spot as the bottom-six split gets set to begin. "It's going to make it difficult now," added Johnson. "There's a lot of massive games coming up. So we've got to be fully focused on them and make sure we don't get dragged into that play-off spot. "It's going to be like cup finals. I know it's an old saying, but they're going to be massive games and we've got to ensure we come out on top. "We've done well against the teams in the bottom six this year and we've got to make sure we continue that."